Couple killed as car hit and dragged by train in B.C. LANGLEY, B.C. 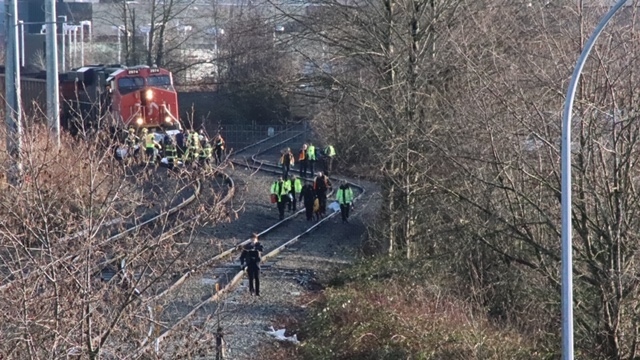 -- Police say a couple has died after their car was struck by a train in Langley, B.C. Staff Sgt. David Brown with the Langley RCMP says the incident occurred Sunday morning at an intersection that sees frequent train traffic. He says investigators are still trying to figure out how the car ended up on the tracks between two traffic arms that prevent vehicles from approaching when a train is coming. 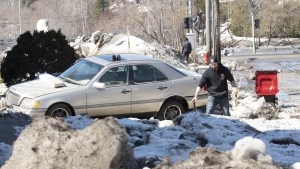 Brown says the vehicle was dragged for "some distance" by a CN train on a Canadian Pacific Railway track. He says police arrived to find the couple in medical distress and administered CPR, but both died at the scene. CN spokesman Jonathan Abecassis says railway police from both CN and CP are assisting RCMP with the investigation. "Our thoughts are with those affected by this incident," he said in a statement. Police officers work at the scene of a fatal collision between a train and a car in Langley, B.C. on Sunday, Dec. 30, 2018.